More mass can absorb more energy. This solution will work but it is not economically practical in most cases. This topic is cover in several technical handbooks published by Smith & Associates. This solution works to minimize the forward tonnage as well as the reverse tonnage. The problem is maintaining tooling without an experienced in-house die repair department. Also, it cannot eliminate 100 percent of the reverse shock. When press stroke and tooling design, allow the optimum is to stagger punched holes so that less than 50 percent of the area to be punched or blanked is engaged at once with proper sequencing, a second set of punches can be engaged at the moment the first set breaks through and the reverse load can be counter pressured but the second set of punches in contact with the work material. Build a cushion (typically nitrogen cylinder) that will absorb the breakthrough shock energy. The problem with this solution is that it requires additional forward tonnage equal to the cushion capacity if a blanking application requires 100 tons of forward force and generates 50 tons of reverse tonnage; the tonnage required for this application with a cushion is 150 tons. The most versatile and cost efficient solution to resolve breakthrough shock are hydraulic shock dampers. They are typically retrofitable into new and used presses. 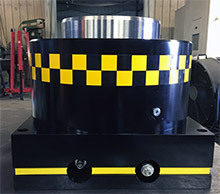 Hydraulic shock dampers absorb the shock energy without derating the press capacity or requiring additional forward tonnage. They are simple to set up or remove when they are not required.